Studying and memorising may not be sufficient for some people. If you feel unsure about your practical, consult your PPCDL center for "refresher courses". This is to ensure that you calculate your direction accurately to avoid hitting the jetty. Collision with jetty constitutes an immediate failure. You can determine the wind direction via the sea, as well as flags along the jetty. As RSYC boats are leaving, their boats may leave a wake/swell which may cause your boat to collide with the jetty if handled improperly. 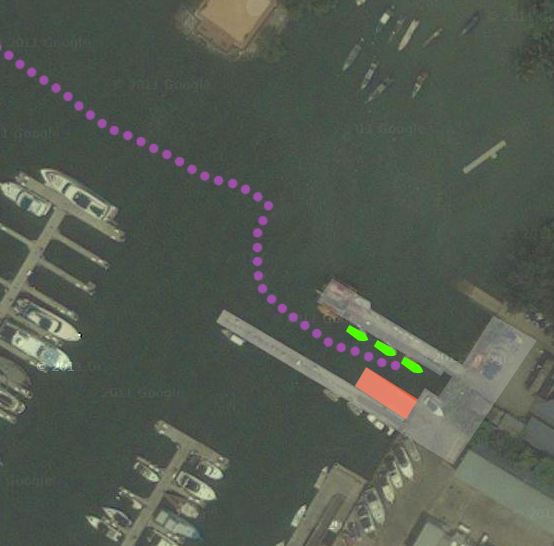 As you are reversing into the sea, be careful not to hit the slipway (marked in red). Remember that your boat is facing land and that you have to reverse out. A potential route is marked in pink. In event of engine failure, casting off requires you to paddle back to shore. This also adds 5 demerit points. The marksheet shows exactly how demerit points are issued.